In a hundred small ways, all Latter-day Saint women wear the mantle of charity, President Thomas S. Monson said Saturday evening. "Rather than being judgmental and critical of each other, may we have the pure love of Christ for our fellow travelers in this journey through life. May we recognize that each one is doing her best to deal with the challenges which come her way, and may we strive to do our best to help out," President Monson said while offering the closing address at the General Relief Society Meeting for the Church of Jesus Christ of Latter-day Saints. Held in the Conference Center in downtown Salt Lake City, the meeting was translated into 82 languages and sent via satellite to 175 territories, nations and countries around the world. In addition to President Monson, Sister Julie B. Beck, Relief Society general president, and her counselors, Sister Silvia H. Allred and Sister Barbara Thompson, also spoke. 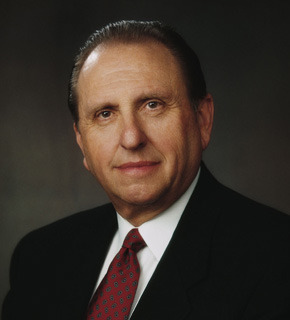 President Monson began his address by asking Latter-day Saint women worldwide to not judge one another. "None of us is perfect," he said. "I know of no one who would profess to be so. And yet, for some reason, despite our own imperfections, we have a tendency to point out those of others. We make judgments concerning their actions or inactions." President Monson said there is really no way a person can know the heart, the intentions or the circumstances of another.